This set of Concrete Technology Questions and Answers for Entrance exams focuses on “Tests on Workability of Fresh Concrete”. Explanation: The water–cement ratio is the ratio of the weight of water to the weight of cement used in a concrete mix. Explanation: Plasticizers and super plasticizers helps to improve the workability to construct the building. Explanation: It is clear vision from the image that the amount of water is more as compared to cement. 5. Which has Low porosity? Explanation: Option A figure has low porosity because the content of water is less as compared to cement. 6. How to improve the workability of concrete. Explanation: Increasing the water cement ratio, helps in improving the workability of the concrete. Explanation: Concrete is said to be workable when it is easily placed and compacted homogeneously i.e without bleeding or Segregation. 8. What is the compaction factor for low degree of workability? Explanation: The compaction factor for low degree of workability is .85 and .95 is the compaction for the high degree. 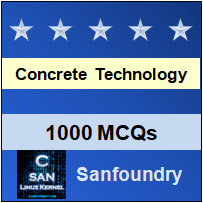 To practice all areas of Concrete Technology for Entrance exams, here is complete set of 1000+ Multiple Choice Questions and Answers.